All Lumitron lamps are constructed with tungsten filaments. 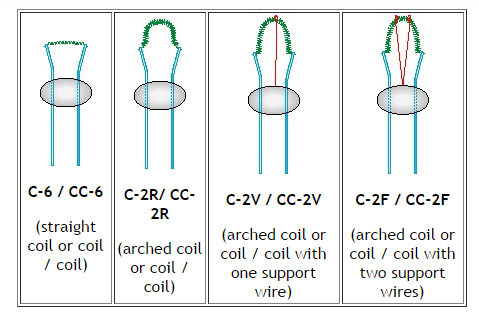 Because voltage capacity is directly related to filament length, the tungsten filament wire is either coiled or double-coiled in order to fit the greatest possible length of filament within the lamp envelope. Molybdenum support wires are added to lamps with very long filaments to prevent filament sagging when the lamp is on. All Lumitron lamps are constructed for high reliability using the “bead-sealed” method. Dumet (copper-clad alloy) wires are fused within a glass bead, and the filament ends are swaged to the wires. This assembly is then placed in a glass tube, the air is evacuated from the tube, then the tube is sealed to the glass bead to preserve the vacuum within the lamp. The glass bead provides mechanical strength at the base of the lamp where the wires pass through and ensures a reliable hermetic seal. The lead wires are tin or gold plated, and the completed lamp is assembled into a base if required. Lamp sizes are designated by the letter T (indicating tubular construction), followed by a number expressing the approximate glass diameter in eight-inch increments. For example, a T-1 lamp is a tubular lamp with 1/8 inch nominal (.118 +/-.007 inch, 3mm +/-0,2 mm actual) diameter. Shock and vibration considerations: Lumitron lamps are designed for exceptionally long life, a high degree of reliability, and low replacement rate. Because of their long life and high reliability, they are used in many critical applications where lamp replacement is difficult or impossible. In addition to long life expectancy, Lumitron’s low-voltage incandescent lamps have withstood the deteriorating effects of random shock and vibration and in the most exacting military and commercial applications. For example, our L-715-AS15, which operates at 5 volts and draws 115 milliamperes of current has a relatively short filament and can withstand considerable shock and vibration. However, lamps which operate at voltages in excess of 6 volts and draw proportionally less current, require longer filaments. These longer filaments usually require internal support wires and are more susceptible to shock and vibration than lower-voltage lamps with short filaments. Dumet wires shown in blue, filaments shown in green, and support wires shown in red for clarity.